I've been quite housebound this week and still need to take it a bit easy but Mr MoaB has the weekend off and I really wanted to get out for just a couple of hours in the sunshine as a family. Therefore we thought we'd pop along to Waddesdon Manor as we always have a nice time there. It's our sixth visit this year! We didn't have a specific agenda for our visit today, we thought we'd just let Little Miss A choose. 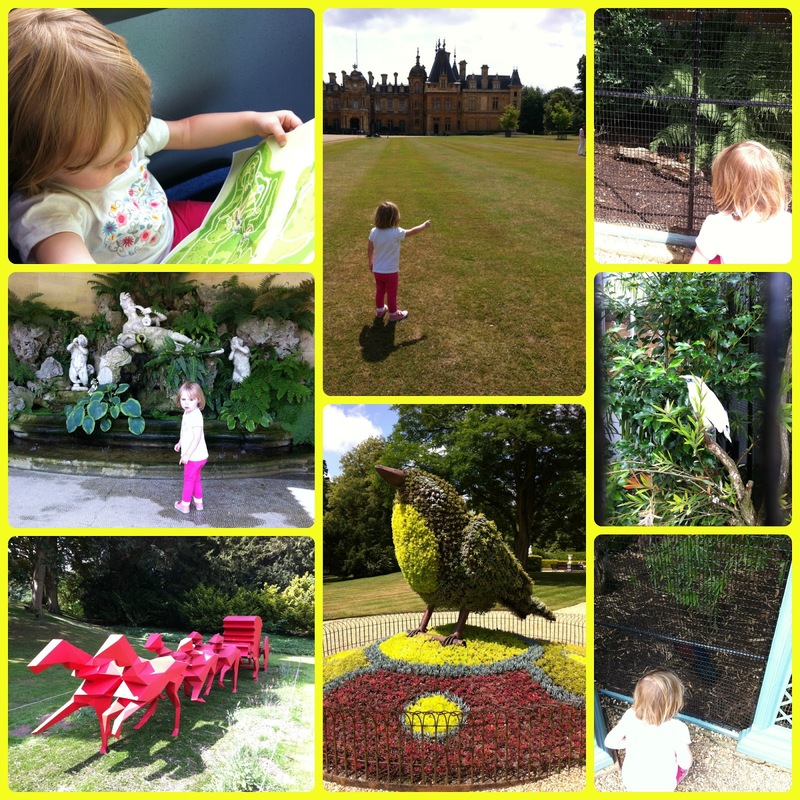 She did a good job of planning on the map whilst we travelled on the courtesy bus from the car park and she chose to see the birds so we headed to the Aviary first. 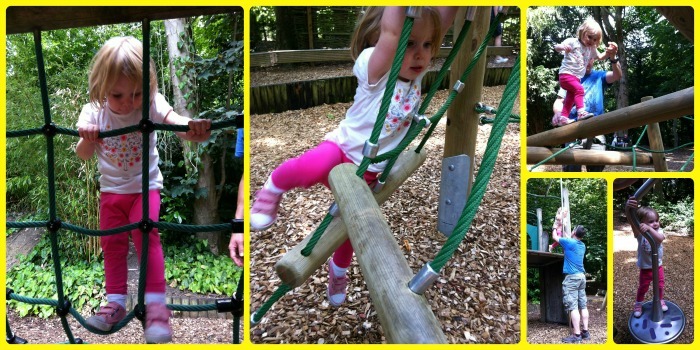 After our bird spotting, we stopped briefly for a quick snack and then walked down to the Woodland Playground. We haven't been to the playground on our last few visits as we've always been busy exploring other areas. I didn't realise that they'd made a lot of changes to the playground and introduced a lot of new equipment. I shouldn't really be surprised by how confident Little Miss A is on all the equipment, even that designed for the older kids, but I always am! She can climb the cargo nets with ease now and there are just a few pieces of equipment where she still needs a little helping hand from Daddy! 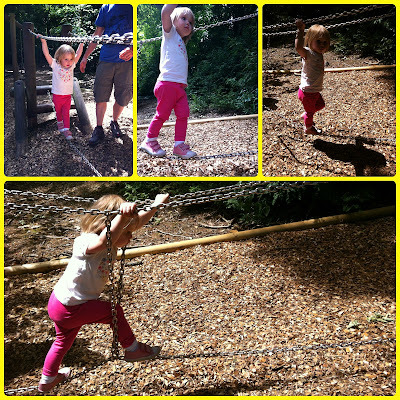 She even managed to do a metal tightrope bridge on her own and made it look easy! However the big hit of the day was definitely one of the new slides. I lost count of the number of times she went on it! She came whizzing down so fast each time it was difficult to get a good photo! We spent quite a lot of time exploring the new parts of the playground then popped down to The Stables for an ice-cream. 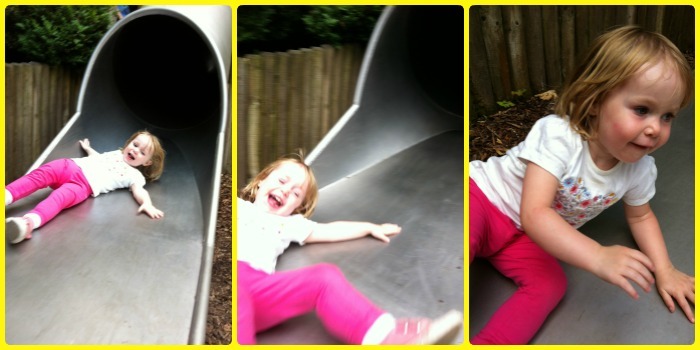 We thought we'd go home at this point, but Little Miss A had other ideas and headed straight back in the direction of the playground so she had another 20 minutes before we finally persuaded her it was home time! The Woodland Playground at Waddesdon was great before but now it's even better! Little Miss A had so much fun and really didn't want to leave. I'm sure she won't let us get away with not visiting the playground on all our future visits!